Symmetrical triangle chart pattern has one falling top and one rising bottom. Falling top consists of highs and rising bottom consists of lows. In other words the falling top holds resistance points and the rising bottom holds the support points. As in a symmetrical triangle chart pattern, the resistance levels are coming lower and lower and the support levels are going upper and upper, both upper line and lower line break out gives valid signal. 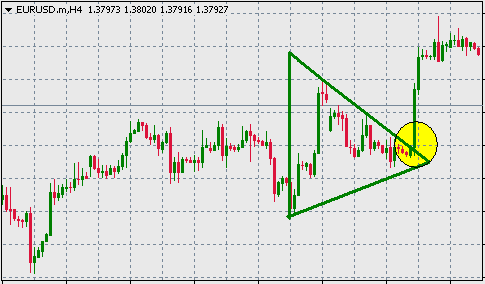 To draw a symmetrical triangle pattern we must have at least two highs and two lows. The stop loss of an order placed based on the symmetrical triangle pattern is placed at the previous support or resistance level, or little bit lower or upper than the support or resistance level respectively.